The Alpha‐Step IQ Profiler is a highly sensitive, computerized surface profiler that measures roughness, undulation, and step height in a variety of applications. 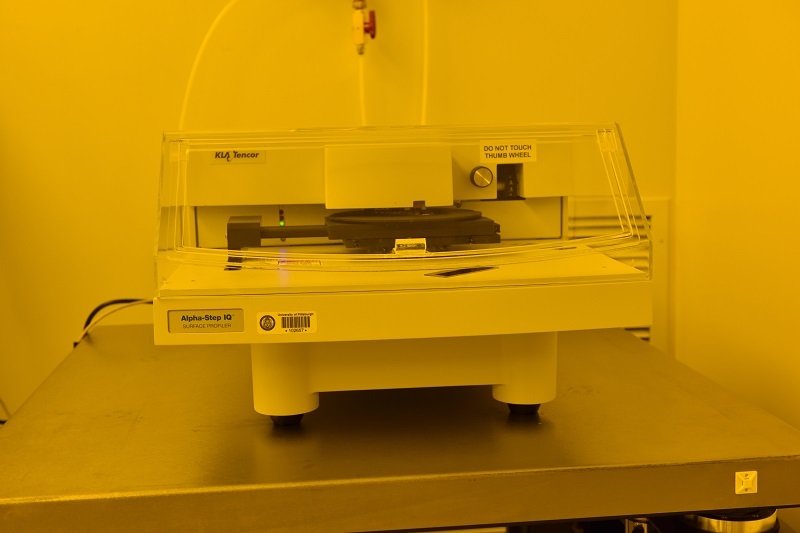 It features the ability to measure micro‐roughness over short distances with up to 1Å (0.1 nm) or less resolution, as well as the undulation of a sample up to 10 mm (0.4 in) long. The computer offers powerful measurement control, data storage, analysis, and networking. Measurement of vertical features ranging from under 100 Å (0.4 μin.) to approximately 0.4mm (15.7 mils), with a vertical resolution of 0.012 Å or 0.24 Å respectively. The horizontal resolution is only limited by the stylus radius and not by the number of data points. However, the minimum spacing between two data points is 0.01 μm. Measurement of many roughness and waviness parameters with roughness and waviness separated by user selectable cutoff filters. Ability to fit and level data, allowing accurate measurements on curved surfaces. Ability to repeat a scan up to ten times and automatically calculate the average, thereby minimizing the effects of environmental noise on measurements. Accommodation of samples up to 150 mm (6 in.) wide and 21 mm (.83 in.) thick.